← ‘POINTS OF VIEW’… AND MORE! Today we have 237 Recipients in India! 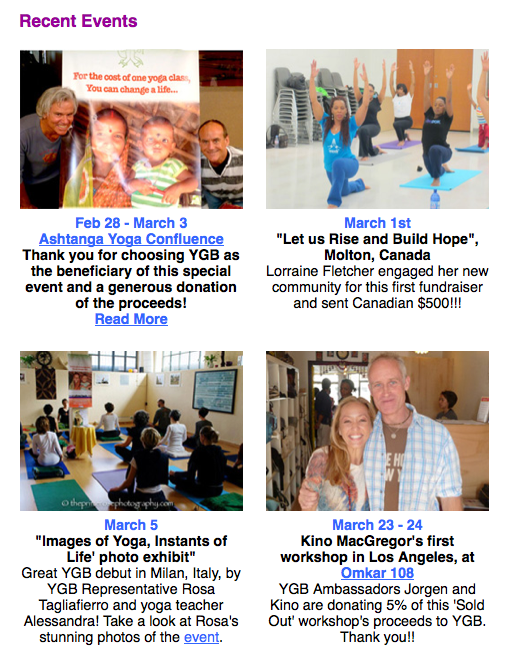 YGB more than doubled the number of YGB fund recipients for 2013!! Thanks to tremendous support from the global yoga community and sponsors in 2012, we are now funding 109 mothers and 110 daughters in West Bengal, 17 orphaned children and 1 medical/dental student in Karnataka!!! YGB is committed to fund each person for 5 years. I want again to thank you all attendants to ‘Images of Yoga, Instants of Life’ photo exhibit for your donations in support of this amazing cause. You can read stories about funded children and other details here. I’ve felt honoured since day 1 of joining YGB and today even more. And you know what? I’m in a very good company… have a look at the attached image! This entry was posted in Yoga photos and tagged italy, Milan, Rosa Tagliafierro, theprimerose, theprimerose photography, theprimerosephotography.com, Yoga Gives Back, yoga photo exhibition, yoga photography, yoga pictures, yogic photos. Bookmark the permalink.